If you’re like most people, your landscape is an extension of your living space, a beautiful outdoor area in which you live, laugh, and love. At nighttime, however, that space can get intimidating or even feel dangerous without the proper brightness. 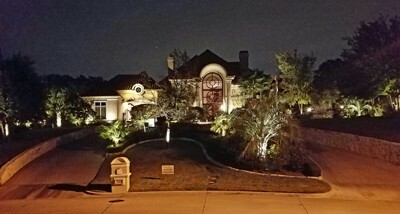 Landscape lighting can help fix the problem, providing both the security you need and the beauty you prize. But how do you balance the two? Here are five tips to keep in mind. Everyone can easily enjoy the gabled eaves and terraced flower beds of your home and garden during the daytime. At night, however, you lose that element, which is a shame when you have windows that look out upon the grounds or when you’re hoping to impress visitors who arrive after sunset. Instead of shrugging your shoulders, consider speaking with an expert about the right lighting to show off your garden while also keeping your home safe. In the interest of security, you might be tempted to light up your home or business like the Fourth of July. However, bright white light isn’t necessary to provide adequate security. Even soft, golden light will deter people from nefarious activity, as long as they show up within its circle of illumination. What is more irritating than trying to sleep and having the outdoor lighting flash on and off? The short answer: nothing. Instead of relying on lights that don’t turn on when they should but seem to turn on at all other times, use steady-state lighting in a variety of styles. There’s another kind of security you may not be thinking about: footing. Without light, paths can get treacherous, so make sure some of your lighting budget goes toward illuminating your path. This is also helpful to protect against trespassers. If you light the walkways but make the rest of the yard relatively impassable, then anyone approaching the building will have to use those paths, which might ward off any unwanted visitors. 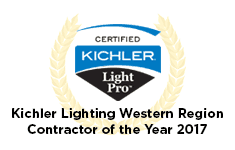 When you work with a knowledgeable lighting company such as Enhanced Outdoor Lighting & Design, you can feel confident that we keep security in mind. We’ll help you pick tasteful, effective lighting that enhances your landscape rather than detracts. We invite you to contact us for a free quote.